​This April, Christopher and James from FUTURE GHOST will be holding a special media presentation at Denver’s StarFest Convention. This year’s guests include William Shatner, Nichelle Nichols, Scott Grimes from the Orville, Ben Browder from Farscape and Stargate SG-1 and other luminaries from the entertainment industry. StarFest began in 1977 and has continued to grow exponentially, featuring such icons as Tom Cruise, John Travolta, Francis Ford Coppola, Christian Bale, Tim Burton and many other actors, directors and producers. StarFest has always been known for it’s outstanding volume of activities, studio presentations and educational seminars, film festivals, discussion panels, celebrity autograph and photo sessions with candid Q&A sessions and dinners, Costume and talent contests, dances, musical performances, model and art shows, collectible marketplaces and fan club presentations. This will be Christopher and James’ 13th time attending the convention together, coinciding with their 13th year as paranormal investigators. StarFest remains their favorite convention of the several held throughout Colorado. Over the years they have met many of their most inspiring muses, have sold several original pieces at the Art Show and Christopher has won three awards at the StarFest Model Show. This will be their first presentation and both are very honored to have been included in this year’s activities. Christopher: “I attended StarFest for the first time in 1996. I only knew that it was a sci-fi / fantasy convention. I didn’t know what to wear, so I pieced together a bunch of technopunk discards from my former days in the 90’s rave scene and went as a sci-fi bounty hunter. It was like Halloween, everyone expressing themselves with their own unique cosplay. Jeff Goldblum was there, and I got to see Kate Mulgrew and John de Lancie perform a play together. I had never been so overstimulated. I grew up in the 80’s, wanting to be Alex from The Last Starfighter, and in this place which resembled a space port through my childhood lens, it turned out many other people there had the same fantasies, aspirations and longings. Join FUTURE GHOST at the Marriott Denver Tech Center for StarFest 2019, April 26th, 27th and 28th. Their presentation will be held on Friday the 26th at 8:pm. Follow the links below for more information and the current StarFest schedule, as well as a special blog Christopher wrote in 2013 regarding his StarFest experience that year. Every Monday you can find Christopher from FUTURE GHOST on Paranormal 911 at 7pm on Travel Channel. He plays one of the experts. Minus the beard. Click the link below for a description and airtimes. The new paranormal series Christopher filmed in November of last year will preview on Travel Channel on Monday, March 4th. Check your local listings and click the link below for more info! We had a lot of great adventures, opportunities and experiences this year. We wish everyone the same in 2019 and we thank you for your support! The Sunday evening of Nov. 25th, on the Travel Channel, catch Christopher from FUTURE GHOST on Scariest Night Of My Life. 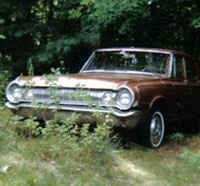 The episode is called The Apartment & It Came From The Basement, and recounts the experiences he and James shared while living near a park where a tragic plane crash occurred. Check your local listings for showtimes! “Flying, flying, filming, flying, flying. Back to the grind and I haven’t even had time to post pics. And how is next week Thanksgiving already? See my hotel room at the end of this long “Poltergeist” hallway? I felt just like JoBeth Williams but was too tired to run down it. Bitterly cold in Upstate New York, which I remedied with a nice hot bath and some room service while learning lines. The clock hadn’t been changed since Daylight Savings and although my phone automatically adjusted to the time zone, I was still disoriented. I watched Interview With A Vampire while ironing shirts so I could channel some of Lestat. I then sat in this chair until 2:am memorizing sentences, working on punctuation and delivery and listening to the rain tapping on my window. The next day’s taping was so smooth and I was honored to work with so many amazing souls, from the producer to the travel coordinator to the director and crew. By late afternoon I was off again and by the time I landed in Chicago, I had to look at my boarding pass to remember exactly where I was. And it was already decorated for Christmas! I forgot to remove my belt at the TSA and got felt up by a big Bears fan. I was still made up from filming and couldn’t wait to wash the pomade from my hair. I binge watched Wolf Creek Season 2 on my iPad all those thousand miles, by then thoroughly disgusted with plane “snacks”. And although I picked the perfect backpack, I will never again make the same mistake with the weird brown shoes I wore. Or the terrible earbuds I brought. But yeah, it was good for the soul and a perfect way to start a new season. The FUTURE GHOST binder I made and used for my notes, the one on the ottoman, was repurposed and now holds the rough draft of the book I am working on. All of my dreams lately have been so noir. They have been flavoring my writing and every night I go to bed looking forward to my dreamtime. The program he worked on is now in post production, with the final elements being added (music, special effects, narration, titles, etc. ). We should expect to see it air next year, most likely in time for the Halloween season, and will keep you updated on its progress! From our Halloween weekend exploration of a former sanatorium in Colorado Springs. This area was the main dining hall of the Cragmor. Thanks to Shaun Crusha and COPIAM ( the Colorado Alliance of Paranormal Investigators and Mediums ) for the invite. In the area above and below James’ seat, one can see a lot of noise. Whether paranormal or pareidolia, we always strive to preserve and acknowledge the wonder of the Halloween season! A screencap from the new episode of Most Terrifying Places In America. It premiered last night on the Travel Channel. The episode is entitled The Unnatural World and features Christopher from FUTURE GHOST as the Historian. This is the program he filmed in Cripple Creek last April. It will be airing again this ( Monday ) afternoon, then again on Sunday October 28th and Monday October 29th. Check your local listings for showtimes. The episode is also available on Amazon and iTunes. Tune into the Travel Channel again on Sunday, November 25th for a brand new episode of Scariest Night Of My Life. The episode is titled The Apartment & It Came From The Basement and features Christopher in the second segment. That story concerns the experiences he shared with James when they lived near a park where a tragic 737 plane crash occurred 27 years ago. Christopher is currently working on another series and finishing a book for publication next year. The book will comprise the experiences he and James have shared in their 13 years as paranormal investigators. Thanks to everyone for joining us at various events this year. It’s been a very rewarding Fall season and we are so grateful for your support! Christopher Allen Brewer from FUTURE GHOST will be today’s guest on the John Thunderheart Hour. He will be discussing their latest involvements in the paranormal field and upcoming television appearances. This time last year, followers will remember their paranormal road trip to California, their stay aboard the Queen Mary, the night they spent on Alcatraz and their visit to the Winchester Mystery House and their investigation of the U.S.S. Hornet. Christopher will be speaking about some of their findings and an upcoming event where they will be sharing the work they have accumulated in the last 12 years. Follow the link below to peruse other shows FUTURE GHOST have appeared on. Today’s program will be posted after it’s afternoon recording. Thanks for listening! The new book from longtime colleague and friend, Stephanie Waters from Schiffer Publishing! For over 12 years, this Colorado-based group of paranormal explorers have researched and investigated haunted hotspots throughout Colorado and beyond. Their esoteric and spiritual approach to ghost hunting ( their founder being Oglala Sioux ) has resulted in an impressive library of spirit photography, videos and voice recordings. They have been featured on the Travel Channel, SyFy, Destination America, BIO, Fox News, Lifetime Movie Network, Fuji TV in Japan, UKTV Play in the United Kingdom and Travel + Escape in Canada. In their home state, they have been interviewed by the Denver Post, the Independent, Fox 31 and were most recently featured speakers at Denver Comic Con. This presentation will showcase the startling findings from their many years in the paranormal field, including their scariest stories, and will also reveal successful methods of investigation, spiritual cleansing and protection. Listen to the phantom voices they have captured, view chilling photos taken from several well-known locations in the ‘Springs, and watch footage recorded from infamous sites in the area, all while finding out about Colorado spookiest urban legends and where to witness unexplained phenomena. Shaun Crusha of the Colorado Alliance of Paranormal Investigators and Mediums will also be on hand to share his knowledge and demonstrate ghost hunting equipment, including a Spirit Box. Giveaways will also be held for attendees. A great way to get in the mood before Halloween! Christopher: “One of the first shows I can ever remember watching was In Search Of with Leonard Nimoy, which originally ran from 1977-1982. As a child of the 80's, I found this program to be perfectly entertaining. Some of the episodes were really spooky for an 8 year old, and I always found the theme song eerie but irresistible. I just had to find out what each episode was going to be about. By the time the end credits rolled and that theme song came back on, I knew what I wanted my future to be, which was the pursuit of these mysteries. Because the show got me asking so many questions, my father would watch with me. Many of the topics they covered seemed unbelievable, but my dad never once told me they weren’t true, he let me make up my own mind about it. It made me want to get out and explore, if not to find answers then to simply bask in the mysteries still left in our world. As Native Americans the concept of a spirit world was far from foreign to us, we had our own universe of experiences we didn’t often share with others. This program opened up a door and showed me that mysterious phenomena was a regular occurrence which happened everywhere. FUTURE GHOST founders Christopher and James took a jaunt up to Estes Park over the weekend for the town's very first comic con. In addition to the plethora of guests they encountered from Star Trek and Battlestar Galactica ( both of them being Trekkies ), they also met a legendary figure who also used to live in Colorado Springs: Cassandra Peterson - also know as Elvira! Christopher: "Elvira was such a big influence in regards to my appreciation and love of horror. The first movie I ever saw was the Texas Chainsaw Massacre. 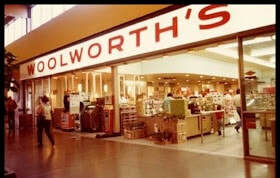 It was 1980. I was 7. Who takes their kid to that kind of movie? My parents, that's who. It was a very traumatic experience for me. I didn't understand why people would willingly subject themselves to such a visceral form of terror. During that time, I had a crummy little black and white TV in my bedroom. I've always had insomnia, so during many of those nights when I couldn't sleep, I began watching Elvira's Movie Macabre. I'd have the TV on real low, with a big blanket pulled up over myself and the set. It was a kind of a secret ritual. There was an element of the forbidden to all of it, mostly due to her cleavage and my not being allowed up so late, but I was eventually able to laugh at these b-grade horror movies and Elvira made such a perfect hostess, silly and pretty and spooky at the same time. I found myself looking forward to more recent scary movies. The next would be The Shining, which also came out in 1980. It still scared the hell out of me, but by then I was able to understand the genre better and appreciate it for what it was. It didn't hurt that Stanley Kubrick was directing, who was also a major influence on my work. That year also saw the release of The Fog, which introduced me to John Carpenter and Jamie Lee Curtis, then Prom Night, also starring Curtis. I fell in love with both of them. When I eventually saw their first collaboration in Halloween on Halloween night, I was smitten. Earlier that year, Friday The 13th had also come out, so by that period of my childhood, I had to beg my parents to let me see it. Horror would forever reign as my favorite genre, with much thanks to the Mistress of the Dark. 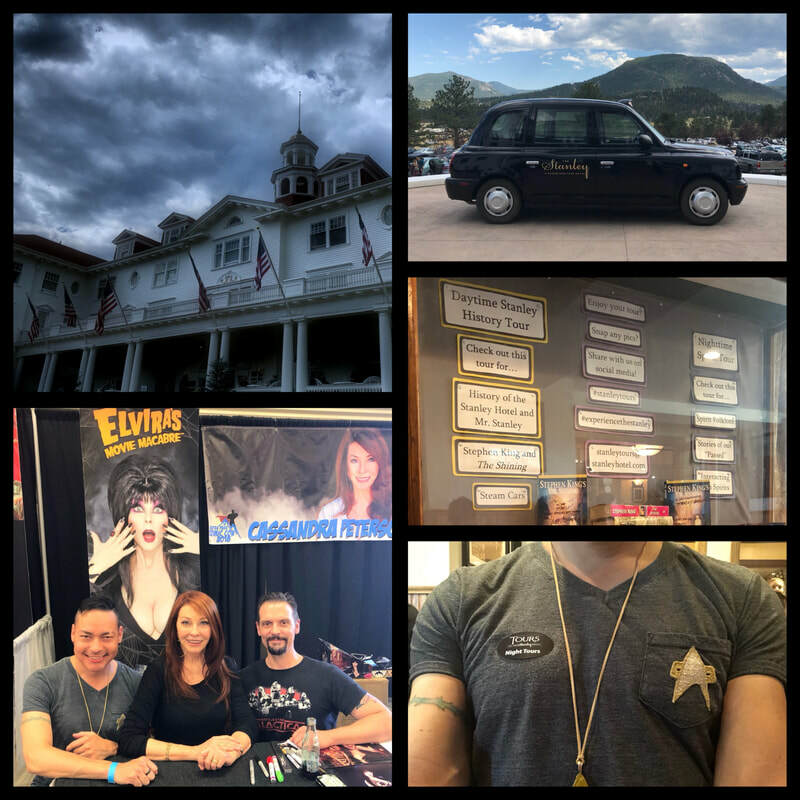 Driving up to Estes Park last weekend to meet Elvira herself and take a ghost tour of the Stanley Hotel ( where Steven King was inspired to write The Shining ) was obviously a most powerful experience. Cassandra was everything I imagined her to be and the ghost tour of the Stanley was fantastic. While it wasn't our first time at the Stanley, it was made so much more memorable by Cassandra's friendliness and gratitude, her amazingly charming spirit, and the mysterious storm clouds that rolled up as soon as we approached the hotel..."
Christopher: “Managing a metaphysical shop has many perks, some of which are the uncorrected proofs that come across my desk from publishers hoping we might carry their books. One of these was Hunt For The Skinwalker, back in 2005. The cover instantly grabbed my attention and I devoured it immediately. Thank the maker for Kindle because I had to repurchase this book more than a few times after lending it out and never getting it back ( never lend a book )! It didn’t take long for the story to explode and for all manner of explorers to traipse around Skinwalker Ranch. There are now countless YouTube videos, books, a questionable movie “based” upon the actual events, and now this new documentary slated for this September ( yes, that is singer Robbie Williams in the trailer ). We have previously “broken” locations into the general public, which sent groups of people out in search of their own treasure. And, much like any attraction that tourists end up “loving to death”, with overpopulation and a frequent incapacity to tread gently, the life force and mystery have often seemed to have been sucked dry, with supernatural activity tending to decrease as a result. FUTURE GHOST have been added to the list of guests at Denver Comic Con 2018! James and Christopher are very honored to have been invited onto DCC’s programming schedule. Their special presentation, POSTCARDS FROM THE UNDERWORLD, will be held in the Central City - Mile High Ballroom in downtown Denver’s Colorado Convention Center on Saturday, June 16th at 3:30pm. Why has paranormal phenomena fascinated and frightened us for so many centuries? From reality shows to horror movies and haunted houses, belief in the existence of a spirit world is something shared by civilizations throughout the ages. We have all heard ghost stories and urban legends that either gave us pause or caused us to sleep with the lights on. This intriguing field has been studied extensively for over 12 years by Christopher Allen Brewer and James Manda of FUTURE GHOST. From a startling collection of spirit photography and audio recordings from several well known haunts, Christopher and James' work has been featured on the Biography Channel, SYFY, Fox News, Destination America, Lifetime Movie Network, the Travel Channel, UKTV and Fuji TV. Interviewed by the Denver Post and filmed by 2-time Pulitzer prize winner Craig Walker, Christopher was exposed to the concept of a spirit world early as an Oglala Sioux. He met James in 2004, who was living down the street from an area where a 737 crashed, a spot known to locals for its haunted history. This panel will showcase the most supernaturally stimulating findings from all of their years as ghost hunters in paranormal hotspots in and around Denver. For budding paranormal investigators to anyone who simply likes a good shiver down their spine, join FUTURE GHOST for a spooky, fun panel on all things that go bump in the night! “There is indeed another layer to everything. Our ancestors were right. They said that during certain times of the year or the night, a veil can be parted and one can be received. Additionally, there are places where the earth’s natural, protective electromagnetic barriers collapse, creating tears between dimensions. In these places, other life forms can be received into our realm. We went looking for a glimpse of that other layer, other realms. We went knocking on the night sky, and something began knocking back. Through our dreamtime, through synchronicity, through chance encounters and unsettling events, we received messages and heard the echoes of those from other ages and places. We were able to record some of their voices, we were able to photograph some of their faces. We followed them through displacements in time, where some were beckoning and some were simply baleful. Click here for the Denver Comic Con website! ​We were elated to discover that Terror Vision will be releasing a limited-edition soundtrack from a television series which was very inspiring to us in our formative years as paranormal investigators. Unsolved Mysteries: Ghosts / Hauntings / The Unexplained drops on June 22nd in single and 3XLP versions. And if you happen to be in Chicago on June 16th, they will be holding a listening party and ghost hunt at Bucket O’ Blood Books & Records. With the show now available on Amazon Prime, we had great fun watching the haunted Queen Mary episode while staying on the Queen Mary last October. There are also a few episodes of paranormally active locations we’ve visited in New Mexico, even a Bigfoot episode filmed in Colorado Springs! Now this release will be another perfect way to generate atmosphere before our next hunt. What was your favorite paranormal episode of the show? A trailer for The Scariest Night Of My Life, Episode 12, featuring Christopher from FUTURE GHOST. This program is currently airing on the Travel Channel, as well as Travel + Escape in Canada and UKTV Play overseas ( both of which can be viewed with an Express VPN subscription for those here in the States ). Enjoy the teaser! On April 28th, 2012, a Biography Channel episode of My Ghost Story : Caught On Camera premiered in the U.S. featuring Christopher & James from FUTURE GHOST. Their story concerned a network of underground caverns which the Utes believed to be a sacred entrance to the Underworld. It was Christopher’s first of two episodes shot for this series. After the Lifetime Movie Network purchased the series, the show eventually went into hiatus and production was discontinued. That story focused on a former cemetery in Denver, a story which FUTURE GHOST is still planning to release this year. In the meantime, enjoy these highlights from their very first episode! The episode of The Scariest Night Of My Life featuring Christopher from FUTURE GHOST aired over the weekend in the U.K. on the Really Channel. The episode ( #12: The Apartment / It Came From The Basement ) is the one he filmed in Chicago in April of last year. This Canadian production was recently picked up here in the States on the Travel Channel, and can also be viewed on UKTV Play with an Express VPN subscription. This paranormal series showcases supernatural stories told through interviews and re-enactments. One of the most entertaining portions of the show concentrated on the actors portraying Christopher and James, as well as the special effects used throughout the program. The series originally aired on Canada’s Travel + Escape Channel last Autumn and we are looking forward to watching the episode again on American TV this fall season! Selected clips from FUTURE GHOST's visit to the U.S.S. Hornet. Christopher: "As soon as we landed from our Denver flight to San Jose, we rushed straight to the Winchester Mystery House for the Explore More Tour. It was Friday the 13th and all of the wildfire smoke had turned the sun an eerie, apocalyptic red. When we got there, we were disappointed to find out that you weren't allowed to take photos inside the Winchester. The tour was a little rushed and there were several guests in the party. It was a lot more touristy than we thought. They also kept referring to Sarah Winchester as “bizarre”. We kind of took offense to that. She was eclectic, suffered great tragedy and had overseen the construction of such a marvel to explore. We didn’t find anything about that bizarre, just misunderstood. As such, we were really looking forward to boarding the U.S.S. Hornet that night. One of our favorite paranormal television shows was MTV's Fear. We watched the U.S.S. Hornet episode on the plane to get us in the mood. We would soon agree that the real gem of paranormal San Jose is the U.S.S. Hornet, which offers a few different and exciting exploration options from people who truly know and greatly admire this massive ship. Everyone was so friendly and accommodating and encouraged the use of ghost detecting equipment. Although nothing of particular importance occurred during our tour, we had a fantastic time exploring the belly of this great foreboding whale. The stories we heard while investigating this ship at night, in the dark, were riveting, and we were able to use our equipment for extended periods of time in several different areas. The guides also had some know-how as far as ghost hunting and everyone involved had some eerie paranormal experience to share. It made the ship seem more alive, and we can't wait to return and try one of their overnight experiences." James from FUTURE GHOST will be signing his books at Celebration Conscious Living Store's Local Author Day from noon to 4:pm on Saturday, March 24th. Stop by, say hi and have a book signed! Click the link below for more details! Selected clips from FUTURE GHOST's nocturnal visit to Alcatraz Island in October of 2017. We hung back often and explored what we could by ourselves, passing these abandoned, decaying structures, looking at this desolate dream world in hues of blue. The actual prison was packed with people, free people, loud and unpredictable. It made making a connection with the structure difficult. James and I were placed in solitary confinement with a handful of people and had the door shut and locked on us. I wasn't claustrophobic, and could see in the dark thanks to my camera, but I could tell some people were having difficulty under such conditions. We were only there for a few minutes. I couldn't imagine what inmates suffered there, but I started to. I backed away until my back was touching the wall. It was then I felt a sharp pain in my side, along with the impression of a man being shanked. Of all the haunted buildings we have visited, Alcatraz was the only one I had to consciously unplug from. The sense of desperation and encroaching madness was extreme, and I remember being so relieved when we finally entered the brightly-lit gift shop at the close of the tour. It was a beautiful experience, aside from the uncomfortable vibrations seemingly absorbed by every piece of concrete, brick and steel that cover the island. Afterward, we took a fun rickshaw ride back to the paranormally-active San Remo hotel, which was a former brothel. If any of the former working girls tried molesting us in the middle of the night, we wouldn't have known, such was our exhaustion. Alcatraz took a lot out of us, and even now when I dream of that place, it's still in surreal shades of blue." Click here to visit the Artovision website! ​Did you know The Bradford Exchange features an “America’s Most Haunted” Illuminated Village Collection? We’ve been collecting them from the start, from the Amityville and Lizzie Borden houses to Franklin Castle, Fort Mifflin, Calcacieu Courthouse and others. Each sculpture lights up, is extremely detailed ( including phantoms in the windows ) and comes with a mini newspaper detailing the buildings haunted history. We’re still hoping for a Stanley Hotel but we’re running out of shelf space! James Manda from FUTURE GHOST releases his newest book on Amazon! Much like his previous work, James once again delves into dreamtime, surrealistic and synchronistic realms through a simple story told with animated characters, imaginative backgrounds and bold colors. Jason, a lonely boy is disturbed by a recurring dream of an endless staircase laced with monsters. He learns to be brave from his imaginary friend (inner voice? or guardian angel? or the early stages of intuition). Through that new found courage he finds a kindred spirit in another little boy as they become fast friends. Drawn from the author's own childhood along with working with children at a Montessori school, deaf and blind school, as well as special needs school. He delivers another poignant almost autobiographical account in the sweet narrative. Follow the link below to purchase the book and view previous titles from James! When we visited the estate a few months ago, we found that the biggest enigma was that they do not allow you to take photos inside. A lot of people don’t know that. No filming and no photos at Winchester. Their gift shop / restaurant is huge. You enter and exit through the gift shop. Chock-full of the expected t-shirts and mugs, to lunch boxes, ornaments, View-Masters and light-up dioramas - anything you can slap a western-style themed Winchester logo onto. They were expensive, too. Our small handful of goods cost us over $100. This was even before our restaurant visit ( if you’re on a budget, simply eat before visiting ). The tours themselves were $39 to $49. It might be a turn-off for some, but we know that revenue keeps the house running. Also, in all of the photos in books and on television specials, the house always appeared to be secluded. This is not the case. It’s smack-dab in the center of a busy San Jose city complex, across the street from a movie theater. From the photos, one might gather a sense of massiveness, but it’s actually much smaller in person. You are not allowed to wander off on your own. None of the tours are self-guided. You only have scant moments to spend in each room ( as there are so many - so make sure to use the restroom first ) until your group is herded into the next portion of your tour ( we tried all 3 tours ). Definitely not the ideal conditions for a ghost hunt of any kind. Alcatraz was the same way. And much like tours in the caves of national parks, you are forbidden to touch anything. It was very restrictive. The young people who give the tours recite from a script. Our guide didn’t know much beyond the regular spiel he was expected to memorize, so do your research on the house prior to coming. You will only be given snippets of general trivia in the course of a tour, which run an hour to just over 2 hours depending on which one you select. From the guides to the people behind the gift shop counter, no one seemed too interested in or connected to the house. It was a job and they were there to keep a business running. As such, there are things which destroyed the romanticism of the estate. We found it hard to connect with the spirit of the environment, the spirit of Sarah, and the spirits of the untold many who fell by the Winchester rifle. Also, people kept calling Sarah bizarre, which we found offense with. She was obsessed, to be sure, but in light of the tragedies she suffered, we only thought her misunderstood. Our impressions from walking her beautiful estate was that she was a very focused, busy individual simply attempting to bring balance to the chaos around her. We did enjoy our visit and would definitely encourage others to see this wonder for themselves. When the Lionsgate horror movie is released next month, business is expected to increase dramatically, especially during the Halloween season. Our hope is that other visitors might not be as disappointed if they know some of these things prior to visiting for the first time. In all honesty, though, the real gem of paranormal San Jose is the U.S.S. Hornet, which offers a few different and exciting exploration options from people who truly know and greatly admire this massive ship. The stories we heard while investigating this ship at night, in the dark, were riveting, and we were able to use our equipment for extended periods of time in several different areas. The guides also have some know-how as far as ghost hunting and everyone involved had some eerie paranormal experience to share. It made the ship seem more alive, and we cannot wait to return and try one of their overnight experiences. Click here for a great article on the Winchester! For our latest updates and paranormal news, visit our Facebook page from the link below. ​To see what we've been up to in the unknown world, visit our blog page from the link below. A lot of us couldn't have kissed 2017 goodbye soon enough. We had our struggles, but looking back there were so many things to be grateful for. We saw many occasions where we could have allowed fear to dictate the course of an event, but we refused to be manipulated. So, the experiences we had included answering a casting call and being flown to Chicago to film an episode of a paranormal Travel Channel series, then submitting a short video to one of our favorite musicians and being featured in her latest music video. We met John Cusack, Linda Blair, cast members from Stranger Things, as well as other actors and actresses from franchises like Twin Peaks, Star Wars, Star Trek and Silent Hill. We journeyed to California and explored modern mysteries and urban legends, including one site which ghost hunters consider to be the holy grail of haunted hotspots. A Native American, Christopher received a very powerful and pertinent vision one evening during dreamtime. Also while in California, we were able to visit locations featured in some of our favorite films. When we returned, we were featured in paranormal article for a major newspaper. November 16th, 2016, the season finale of American Horror Story: Roanoke airs. One of the segments includes an episode of a paranormal television series called Spirit Chasers, a name we had used for 10 years. After this episode aired, with a perfect and embarrassing summation of paranormal reality television, we decided to close the door on our former selves. Christopher’s father had passed away 18 days earlier. After speaking with a Sioux elder the night before the service, his views on our interaction with the spirit world began to change. We had been known as The SpiritChasers since 2006 ( originally The Othersiders until a Cartoon Network program by that name surfaced ). There were no others like us. After the American Horror Story finale, we obviously wondered where their writers found the inspiration for Spirit Chasers. We then discovered by that time that there were several other paranormal teams using that name, none of them affiliated with us. Two groups were even using our copyrighted photos and one of them spun a tour from one of our earliest blogs. It was high time we evolved into something else. By the end of that year we would come to be known as FUTURE GHOST, reshifting our focus and our intent. By the next fall season, we would go on a paranormal pilgrimage to California, visiting all of the haunted sites we had always dreamt of. We met people who inspired us while on our supernatural journey, celebrities from paranormal cinema including Linda Blair, John Cusack, Adrienne Barbeau, Jodelle Ferland, Matthew Lillard, and cast members from Stranger Things. We filmed an episode of an upcoming paranormal reality series for Destination America, did some local radio and were interviewed in a major local newspaper. We also began finishing a book of our communion with spirit for release in fall of 2018. We have been absolutely grateful for the people we've met and the opportunities and experiences we've had. We are looking very forward to what we will be manifesting in the new year and give many many thanks to all of our friends and supporters over the years. "Daniel is a well-respected Paranormal expert. However, his sensitivity leaves him tormented by those entities needing to cross to the "other side." Daniel is now consuming a gallon of vodka per day to quiet "the voices." That, combined with easy access to pain meds and opiates Daniel takes for his lupus diagnosis, has left him spiraling out of control. His family fears that it is only a matter of time before he is lost inside a world he cannot escape." FUTURE GHOST have seen many in the paranormal field become obsessed, whether they’re looking for authentic contact or viral attention, fortunes, answers to ancient mysteries, or simply the take-home drama of paranormal reality TV. Thanks to the “light entertainment” of creatively-edited supernatural television, we have seen many people place themselves in extreme states of paranoia and fear, utterly convinced they are being attacked by demons or djinn, that their children’s lives are in danger from centuries-old spirits, all because they saw it on the TV. A strong diet of fear-based programming will do this to you. On the other end of the spectrum are lightworkers who find themselves ultra-sensitive to energies past and present and can’t walk three paces without being thrown into flight-or-fight mechanics. One of these episodes features a man addicted to hand sanitizer. It’s very reminiscent of some who feel the need to “smudge” constantly in a world that seems to offer less and less harmony. How did we cope before reality television? Before the internet when we are expected to process so much information and retain so many passwords? Before social media, when so many prefer to wear their spirituality as opposed to congruently practicing it? Just as there are chemical addictions, there are a wide range of spiritual and superstitious addictions we can succumb to. As we approach 2018, how are we approaching the paranormal in our lives? How do we perceive mediumship or empathic abilities? We’re conscious of manifestation, but what are we manifesting? How are we allowing fear-based programming to alter our thoughtforms and dictate the decisions that stem from them? Do we see genuine evolution or are we spiraling downward into Victorian party games and sideshow attractions where would-be paranormal celebrities tattoo a ouija board onto their chest or hawk their snake oil on the paranormal convention circuit? Publicity, vanity, followers and feeds that offer very little advances in a realm whose previous “golden age” de-evolved into poorly photoshopped photos of papier-mâché phantoms and cheesecloth ectoplasm. Celebrity vs. credibility, the gospel of television, and the addictions and obsessions it creates. One of the EVPs we recorded during our stay aboard the Queen Mary. We had inquired about the infamous spirit vortex in the pool room, and what it was about this room that would feature such a phenomena. Our guide brought our attention to the ceiling, which we initially thought was inlaid with Mother of Pearl. We were informed that it was actually quartz crystal, a natural conductor, amplifier and director of energy. In the audio sample, you can hear our guide describing the properties of the ceiling, when 4 seconds in the voice of an unknown male can be heard breathily whispering, "save me". Our Canadian fans will be happy to know they can catch Christopher from FUTURE GHOST in one of these upcoming episodes. Looking very forward to seeing what actors are portraying Christopher & James in the reenactment segments of the program! This week’s issue of the Colorado Springs Independent features interviews and photos with James and Christopher from FUTURE GHOST, as well as colleagues Shaun Crusha and Dawn Agna from the Colorado Alliance of Paranormal Investigators and Mediums, plus Rich Horn, founder of Colorado Para-Tech! Many thanks to Alissa Smith for such a well written, balanced article. Pick up your copy today! FUTURE GHOST have been invited to a Paranormal Expo at the historic ( and ​haunted ) Runyon Theater in Pueblo. This theater was originally known as the Rialto, designed by the Boller Brothers in 1918. In 1935 it was remodeled and became the Chief Theater. In July of 2003, it became a performing arts space for the Damon Runyon Repertory Theater. After their closing in 2016, Brian Palomar and Keith Avery bought the theater and created the Spirit House Cabaret. It a building full of echoes and energies from the past, a perfect venue for ghost hunters to show their paraunity and bring their passion to a place with so much history. Join us on Saturday, November 4th from 5:pm to 12:am, for an evening full of supernaturally stimulating events from ghost hunts and haunted history walks to séances, media presentations and more. FUTURE GHOSTS’s time slot is still to be announced, but for now mark it on your calendar. We are also looking into opening up a great paranormal landmark in Colorado Springs. More announcements to come. Be there and be scared! James and Christopher from FUTURE GHOST recently returned to the John Thunderheart Hour on KCMJ 93.9 for a Halloween-themed show on URBAN LEGENDS OF COLORADO SPRINGS. How many of these have you heard of? Click below for the link! ​Over the weekend, James and Christopher had the pleasure of meeting Linda Blair at Colorado Springs Comic Con. Linda used to host one of Christopher's favorite paranormal shows, The Scariest Places On Earth. She also confirmed the reason for its cancellation: when Disney bought ABC Family, it had no idea what to do with the show as it was too scary for kids and not family friendly enough. Thank goodness for bootlegs as FUTURE GHOST have every episode! Granted, the disclaimer at the end of each episode revealed that some events were recreated for dramatic effect, but it was still spooky as hell, tremendously fun, and a perfect program to have on when getting ready for an investigation. Fortunately you can still find several episodes on YouTube. Sweet dreams, kids! "Today we are sharing a photograph James Manda took at Fargo's Pizza Co in 2011. We heard about this local legend from a former employee who referred to the entity known to haunt this eatery as "The Fargo's Phantom", but we never dreamed we'd have an opportunity to photograph it! Read all about our experience here in the blog below and should you get an opportunity, visit this historic, beautiful restaurant and decide for yourself if "Sophia" still sits at patron's tables!" Click here to read about The Fargo's Phantom! "Today we are sharing a photograph James Manda took at the Colorado Springs City Auditorium during our early days of research. Christopher worked the metaphysical fairs here since 2003 and heard countless tales regarding the strange happenings inside the auditorium and Lon Chaney Theater. Read all about their experience here in the blog below and should you get an opportunity, visit this historic, beautiful building and decide for yourself if spirits still roam it's many rooms..."
Click here to read about the spirits of the City Aud! Today FUTURE GHOST joins paranormal author and friend Roger Pretti for an exclusive day of exploration, roaming about old mines, graveyards, historic buildings and abandoned railroad grades - several of Leadville, Colorado's legendary haunts. His book, Lost Between Heaven and Leadville, is available for purchase at Celebration Metaphysical Store ( as well as a selection of arrowhead pendulums made by Roger himself ). The book is a product of over ten years of research from this writer and former part-time editor of the Leadville Chronicle. You can also find it at the Book Mine, the National Mining Hall of Fame and Museum, the reportedly haunted Delaware Hotel, and at the ghost tours he conducts in Leadville throughout the summer. Been on any good ghost tours this year? We recommend the one at the Brown Palace in downtown Denver, the Denver Botanic Gardens in October, or visit ManitouLegends.com for Manitou Springs walking tours, and, of course, Roger's Leadville tours. The fall season will be here before you know it! Many of you know that Christopher is a collector of screen-used props, costumes, storyboards and animation cels. He has several pieces from Battlestar Galactica, Lost In Space, The Robinsons, eXistenz, The Mysterious Cities Of Gold, M.A.S.K., Steven Spielberg's Taken, Stranger Things and more. Here's his latest, a costume used during the production of Netflix's paranormal action-thriller SPECTRAL. We can't say for sure if he'll be wearing this to conventions and tours this season, but if you see a SPECTRAL soldier in the field this fall, you'll know it's him! To view the SPECTRAL trailer, click here! Yesterday a woman was telling me about a stone she had which turned black. She was instructed to get rid of it, so she threw it in a field. Then, her friend told her she was supposed to bury it. She had put herself in a state of worry and confusion, thinking a certain amount of negative energy would cling to her because she had done some step incorrectly. She seemed more concerned about all these steps she should do and this "power" that had turned the stone black. She said it loud enough so that everyone around her could hear. It was obviously theater for her, and she needed an audience, some validation of her connection to spirit. I informed her that she didn't need to do the hokey pokey, that she didn't need to bury the stone at the 13th hour under a blood moon ( which actually sounds like fun ). I told her all she needed was to focus on the intention of clearing the negativity from her life, and that meant monitoring her own thought forms and vocabulary. Energy has to be directed somewhere. If it's not going into the positive, it's going to go into the negative. So why do we always plug our energy into the negative, into silly superstitions and confusing scenarios? I hear from people all the time who believe a witch has cursed them and they are under some spell. They're absolutely right - they are indeed under a spell, though usually one of their own making. Follow the link below for Caroline Myss's latest blog on such spells. And be mindful of any you've been casting on yourself or others. Ice cold Cokes, glow-in-the-dark pins, and some mini flashlights. Our personalized, limited-edition giveaways for this season. If you see us out in the field this fall, don't be shy - come say hi! ​We often look to spirit for validation of our experiences, in synchronicities, dreams, however we allow the divine into our lives. After James captured the photo of the hand in the mirror at the Brown Palace two weeks ago, we paid attention to our dreamtime and remained observant to any chance encounters or happenings - a sort of spiritual stamp of approval. Recently, James was speaking with me about our experience when he realized he was late turning the page on an Edward Gorey calendar, which was still stuck in June ( how this year has flown by ). When he turned the page to July, he started laughing. I asked him what was so funny and he replied, "synchronicity: we were just talking about the pointing hand. Come look." I walked into the kitchen and was startled at July's page, which featured a pointing hand, Gorey style. The hand is surrounded by ghosts and mysterious figures. It is from a cover Edward Gorey did for the book, Haunted America : Star-Spangled Supernatural Stories by Ed Kaye. It made the second synchronicity regarding this experience. When we were at the Brown Palace, one of the first rooms we were taken to was an old smoking room which featured guns and a crest belonging to Napoleon Bonaparte. The area felt almost magnetized, the residual energy was so high. I made the comment before leaving that Napoleon and James were both Leos. I had been wondering about the spirits said to haunt that room when I received a package from a friend. Inside, of all things, was an action figure of Napoleon's ghost ( glow-in-the-dark, no less ). One might say that experience is still haunting us. We have been reading "Murder At The Brown Palace" and other books about its colorful history. A lot has happened at this mysterious hotel since it opened in 1892, and we are grateful to be a small part of that story. ESP. There's an app for that! True, it's a Zener card app you can use to practice your abilities with. Christopher previously just used a bag of M&Ms. He'd close his eyes and guess which color he picked from the bag. He only got to eat it if he guessed correctly. Once he guessed an entire handful! We often forget that we have other abilities beyond the five senses. When we feel someone watching us, what do you think that is? Extra sensory perception. Like any other exercise, if you want to be good at it, you have to practice, practice, practice. Hence the Zener cards. Or M&Ms! The only way is up! Last Friday, FUTURE GHOST attended Denver Comic Con and stayed across the street from the Brown Palace ( est. 1892 ). Their hotel was connected via skybridge and they were able to take a ghost tour and explore the hotel afterward. Christopher noticed many griffins about the hotel, on plaques and plates. Being very familiar with mythology ( as well as owning an entire DVD wallet of treasure-hunting movies and programs ), he knew that griffins were believed to be the guardians of treasure. This hotel also has associations with the Knights Templar, houses a room with artifacts from Napoleon, as well as other legendary ties and mysterious architectural elements. When asked about the griffins vs. gargoyle representation, Christopher and James were informed that some believed there was a treasure tale associated with the hotel. After an hour, Christopher and James had to return to the Colorado Convention Center ( for a photo with Hotel 1408's John Cusack ). They were invited to return to the hotel afterwards to explore. Upon their return visit, James and Christopher decided to instead focus on the treasure aspect of the hotel. They sat at the base of the escalators, in front of a grand mirror ( mirrors tradtionally known to be portals for spirit activity ). When Christopher asked where such a treasure might be hidden, James snapped a photo of the mirror. Inside they discovered the unmistakable image of a women's hand pointed upward. There were absolutely no guests in that area of the hotel during this period. The hand also appears as if it is manifesting from the center of the escalators, an impossibility were there a physical person present, as there would be no room for them to stand there.. The hand looks as if it dissolves near the elbow, which is probable if this is indeed a manifestation of spirit. Quite often, a paradox presents itself in this field where one of the many mediums of our age might look at a paranormal photo and label it "too good to be true". Then they might be attracted to a corner where they report that the spirit of a man is informing him he died in that particular room in 1953. Which is more believable? In this field, which is at the end of the day the study of energy, we are frequently faced with the invisible and the unknown. We are expected to maintain a state of rationality and discernment, even though sightings of a madame who died 100 years ago are nowhere near rational. We are often encouraged to expect a miracle, and yet when presented with the miraculous, our first thought will concern why it could not happen. We will then tear down all elements of this miracle and when we have no explanation for it, we simply label it as no more than a fluke. And yet the next time we or a loved one are facing a serious illness and we ask spirit yet again for a miracle, how do we expect that miracle to present itself when we could not embrace the last one? ​THE OMEGA DEVICE. Wonder whatever became of this? Have these tools really evolved, or are they gimmicks to satiate a kind of Victorian novelty? We often remind people that the best tool you can use is your intuition, something we often ignore or doubt. This is not something only the highly gifted can utilize. We use it all the time without realizing it, when we knew we should have turned left or were just thinking about a person when they called. But intuition is also that little nudge which reminds us when we are unhappy with a job, a partner, a neighborhood. Because there is genuine work and life changes involved in following through with that nudge, we often tune it out. Next time, instead of looking at a blinking box or listening to the distorted, near incomprehensible audio coming out of it, take stock of your feelings and impressions. Those will never lead you astray. ​FUTURE GHOST's James and Christopher were at Denver Comic Con over the weekend and were very fortunate to meet some of the cast from Stranger Things ( and are very much looking forward to the Season 2 premier on Halloween )! John Cusack was also there ( whom they loved in the paranormal film Room 1408 ) as well as many other great guests. They took a delightful ghost tour of the Brown Palace, from which they captured one very interesting photo ( more pics to be posted later ). For now they wish everyone a safe and fun 4th of July and send their thanks for following them on their adventures through the underworld! Our last blog explored the possibilities of unfulfillment and disappointment. Alas, the foretold lack of a Haunted Mansion came to pass. Turns out we only needed to wait a couple weeks for it! Our latest blog is now available by following the link below! Click here for our latest blog! Christopher was recently in Chicago filming an episode of a new paranormal TV series. You can read all about this experience in a new blog by following the link below! ​Flying out early tomorrow morning to film a segment for an upcoming paranormal TV show. It's for a major channel, but we can't reveal anything else - yet! There are a number of events we are working on this season and we are very much looking forward to sharing them with you. We'll be documenting our journey beginning tomorrow. Thank you for all of your interest and support! ​This season, FUTURE GHOST travels to California to visit some amazing historical locations including The Winchester Mystery House ( for a special Friday the 13th event ), a paranormal investigation of The U.S.S. Hornet, spending the night at a former San Franciscan brothel ( The San Remo ), taking a night tour of Alcatraz, shopping at the infamous and very paranormally active Toys R Us in Sunnyvale, stopping by the haunted Point Sur Lighthouse, spending an evening on The Queen Mary and much more. Help us turn it UPSIDE DOWN! ( An excerpt from a conversation between Alice Cooper and Anne Rice ). Paranormal State were mainly responsible for the upsurge in demon popularity in many scripted shows whose credibility was later challenged by costar Chip Coffey. After that, several other fear-based programs followed suit, leading many to assume that for every creak or shadow - a demon was responsible. Unfortunately in this field, the unknown is often taken to a very dark, negative place - as are most things which are misunderstood. This only serves to place the public in a state of vulnerability and fear. I have worked within the spiritual community since 2003. We used to have a booth at the large Celebration metaphysical fairs held twice a year at the City Auditorium. I manage a schedule for 15 local psychics and communicate with them once a day. I have spoken to many intuitives and light workers over the years and they all say the same thing, which is that personal interactions with demons are very rare. We each have a form of spiritual guidance which protects us from that realm. Throughout history, only saints, priests and the very spiritually advanced were challenged by the demonic. We coexist with a myriad of energies, most unseen, and while some of these might be considered malevolent, we don't go proclaiming "DEMON" willy nilly. This is part of the drama and theater that many mimic from television and cinema, reenacting these events within their homes. Unfortunately, there are many “investigators” who will go in and encourage this drama, creating more uncertainty and panic. It is a very irresponsible way to behave. “Primum nil nocere" - one would do well to research the meaning behind this bioethical phrase, “do no harm”, prior to any serious investigation. Granted, the experience will depend upon one's religious background, and my culture did not believe in hell, but I have had a demonic figure approach me on two occasions during my dreamtime. I wanted to experience the entire spectrum of the unknown and embrace my fear. For two weeks I had been playing a videogame about a man who begins receiving letters from his dead wife. He enters a sort of netherworld to find her and is attacked by demons which actually represent his guilt and the shadow aspects of his psyche. This game, the flu I contracted and the fever dreams I experienced as a result, answered some of my questions regarding the demonic. We do not deny their existence, but we also don’t hold them personally responsible for every spooky experience we have. No assumptions should be made regarding the unseen world. In numerology, 2+0+1+6= 9. This has been a 9 year, a time of endings, completion, closing doors. We are to tie up loose ends, forgive, release dead weight and release the past in order to accommodate new beginnings. We saw the ending of a presidential term. We lost faith. We lost several wonderful minds and performers this year. I lost my father, my grandfather, and a man I considered a brother. I have seen many endings in the way friends and family have left jobs, relationships, homes. I walked away from a friendship of 26 years. It was necessary. It was time. 2016 also marked 10 years in the paranormal field for James and I, collectively known since 2006 as The SpiritChasers. This year their journey ends. In the latest ( sixth ) season of American Horror Story ( AHS: Roanoke ), the final episode ( Chapter 10 ) featured a fictional program starring a paranormal investigation team known as Spirit Chasers. This mockumentary-style episode captured to perfection the sort of typecasting common with ghost hunters today. There was an overreliance on technology / tools, a bromance between aggressive male team members, an eclectic, plucky medium, and a general fear-based attitude and scenario. The show was peppered with a lot of running, screaming and "WHAT WAS THAT?!" Granted, it was entirely fictional, but could have successfully passed for any ghost hunting show on television today. Watching it caused some degree of embarrassment, although we have never run down hallways screaming ( which actually looks like fun ). It was simply a fitting commentary on the state of paranormal television and paranormal teams at present. If this is what we've been reduced to, we no longer find it appealing. AHS is simply another show, though we'd hate for others to think this is where we took the inspiration for our name, a mockery of a mockery, however avant-garde that might seem. Originally James and I called ourselves The Othersiders, until Cartoon Network premiered their own paranormal reality series with the same name. By that time hordes of ghost hunting teams had popped up, many of them using abbreviated, scientific-sounding names or simply just any name with the word "paranormal" attached to it. I remember once meeting someone from S.I.O.U.X. Paranormal ( now defunct - many of these D.I.Y. teams lacked longevity ). As an Ogala Sioux, I asked what her group was all about. She explained the meaning behind the abbreviation, which was almost comical. I don't remember what the "X" stood for. It wasn't "X-file", but might just as well have stood for "Xanadu". We stuck with The SpiritChasers, mostly because the name was not in use anywhere else. Now there are several different chapters of the Spirit Chasers all throughout the world, none affiliated with us. Our name was never taken very seriously, and who's to say the next one will, but as so many things have burned this year, we are symbolically offering The SpiritChasers to Pele. I've never felt comfortable having to use the term paranormal. Supernatural I didn't mind, because that was a term I grew up with, but paranormal evolved into something else. It became a circus, a group of muscle shirts, vanity projects filmed with FLIR, duck-lipped night-vision selfies. I've hated describing our collection of spirit photography, footage and audio recordings as "evidence". Evidence of the presence of spirit in our lives, perhaps, though it suggests we had something to prove. All along we have done what we have for our own personal enjoyment. When I moved in with James, he lived down the street from a park where a tragic 737 plane crash had occurred. We had visited several times and took many photos before sharing our experience with anyone. We didn't do it to be on TV, to make money off tours, to gain any sort of notoriety. We did it because we found it entirely stimulating, coming alive in a way we hadn't since the Halloweens of our youth. We are children of the 80's. We grew up watching Poltergeist and Ghostbusters, In Search Of, Unsolved Mysteries and Arthur C. Clarke's Mysterious World. We became fully alive every Halloween, reading ghost stories and experiencing all manner of the supernatural in our homes. We read about Ed and Lorraine Warren, Hans Holzer and other legendary figures, aspiring to be just like them when we grew up. I remember the first time we saw a spirit photo of the Brown Lady of Raynham Hall, and the ghost of the Tulip Staircase. I sat transfixed on both occasions, knowing immediately that when I was old enough and financially able, I would dedicate my life to chasing these spirits, unravelling urban legends and myths. I would become a hunter, like my uncle. For some time now, we have been thinking about something more conceptual than the standard model of ghost hunter, something which could evolve. When my father passed away on Day Of The Dead, I realized that something I used to celebrate now became something I would mourn. My grandfather, who gave me my Indian name, crossed over just one month later. My thoughts about the afterlife would thus evolve. We would evolve. The night before my dad's funeral, I sat with my uncle, who lives on the Pine Ridge Indian Reservation. He was to do the Native part of the service as he still spoke the original Sioux dialect. We talked for a long time. I learned a lot of new words and heard a lot of old stories. We eventually spoke about the paranormal, the supernatural, which for the Lakota wasn't anything extraordinary as we believe we coexist with many different life forms, both seen and unseen. I shared with him a number of pictures from our SpiritChasers photo gallery. While he enjoyed them, he seemed mildly amused. He and his family witnessed many strange things on sacred ground over the years. Regardless, he believed in only two kinds of spirits, those who walked the Milky Way back home and found peace, and those who returned for a special mission. You did not interfere with them. Sasquatches had been seen at sundances, miraculous abilities were witnessed by medicine men, there was actually a Sioux word for aliens, or "the ones who live up there", and even petroglyphs there told stories about humanity's relationship with the interdimensional. I met Travis Walton this past summer, the abductee from whom the movie Fire In The Sky was based, who instructed me not to adhere to the perception of the world of those who do not believe in it, do not truly see or understand it. They will strive only to define the one little corner they can. No amount of "evidence" will ever satisfy them. They will always seek to prove how it didn't happen first, shooting down the miraculous before it ever has a chance to spread its wings. But also, when meeting with the Great Mystery, we shouldn't ask it to prove itself to us. Instead, we must prove we are already aware. Prove we can walk with one foot in both worlds, balancing the spirits of both. An offering of faith is necessary. Expect the miraculous and the miraculous will occur. Every year I have a thought that it might be our last in the field. After 10 years as paranormal investigators, we have seen a myriad of both wonderful highs and stagnant lows. In 10 years, one can come across a tremendous amount of territorialism and competition, ego and insecurity. This year, we caught two different paranormal teams using our photos as their own. One of them even tried spinning a tour out of it. And yet all over Facebook, said teams are promoting "paraunity". Fortunately, however, one can make some very dear friends, and find a better appreciation for community. We have met several more wonderful souls than we have met divas, and for that we are grateful. We have been able to participate in many supernaturally stimulating events with many fantastic colleagues and we wouldn't trade those experiences for anything. 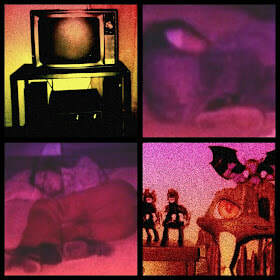 In the paranormal field, there can often be a tendency to simply copy what one sees on television. As they will apply science, so will we, though oftentimes we will place science before imagination. So many of us are so much more supportive now of what we don't believe in than what we do. Debunking, for instance, was applied to narrow down the possible causes of paranormal claims. Some might debunk to offer a rational voice. Some might do it simply to take a mystical experience away from another. And in our field there are so many so determined to puncture, to disprove, to remove, to sanitize. One local ghost hunter was once heard to say that he could debunk anyone's photos ( especially ours ), and if he couldn't, he knew someone who could. So what was the point? Is ghost hunting not at its base the study of energetics? Energy, frequency, vibration - a cosmic template. After viewing a random paranormal show ( in horror ), my uncle asked if people had completely forgotten their cosmic nature, regardless of what the physical world said was or wasn't possible. Exposed to the concept of a spirit world from as early as we could remember, we were often reminded that mystical law is the governing authority of our world. People want miracles, and there are miracles happening every day, but too many are hell bent on explaining how something could not happen or did happen according to them than how it could. Once, during a paranormal convention, a woman was sharing her collection of paranormal photography. She was very proud of her work and passionate about the field. After looking through a few of the photos which featured what she described as "divine fire", I quickly noticed that strands of her hair had simply blown in front of the camera lens and were illuminated by the flash. My cousin was with me and we were perfectly able to duplicate this. Did we immediately run up to her and burn her livelihood to a cinder? We did not, we remained polite and kept silent, but there were some "paraunity" enthusiasts who were nearly heckling her, taking it upon themselves to debunk her work in front of others. Later, during their own event, they were showing guests what the paranormal was NOT. This reduced the woman to tears, and she left the convention early. She no longer takes photos and never attended another convention afterward. That is why we don't take anything away from anyone. It's their experience, their lens, their perception. It's not our business to sanitize it for them. We stand by all of our photos, regardless of what others might think. Paraunity is about respect, and we have always been respectful of our colleagues' work. When we are energetically invested in a tribe, we will therefore embrace only those ideas that they do, will defend who they defend, will learn as slowly as it takes the entire tribe to learn and grasp new concepts. If that tribe is paranormal TV, we can assume that every scripted episode on a major network will be done so for increased viewership, the sale of product and entertainment value. What and who is really moving everything forward? Despite advancements in technology, ghost hunting tools can end up becoming little more than Victorian novelties. We have paid for several "ghost hunts" that consisted of no more than sitting in a dark room while our hosts set flashlights about and put a Spirit Box in the center. We'd have to sit through an endless series of questions, watching little lights blink on and off, listening to badly distorted audio. "I heard, cure thee." "No, I heard Shirley!" Far from the ghost hunts we used to fantasize about, we were expected to be content watching blinking lights and things bobbing up and down while listening to AM radio. It says a lot about this day and age, where people - seated people - feel they are experiencing life through Facebook, their phone, or bingewatching Netflix. Such "ghost hunts" can be a very lazy and irresponsible way of taking advantage of another's wonder. We have reached another golden age of spirituality and awareness, one which is being completely wasted. Because we grew up reading ghost stories and because we came from a race of storytellers, we wanted to remain in that realm. The first time I saw footage of Bigfoot, pictures of the Loch Ness Monster, ancient artistry depicting lost, ancient technology, I didn't have anyone standing over my shoulder telling me it wasn't true, that it was just dust and insects, swamp gas, the planet Venus, or a camera strap. The more we experienced a part of the divine in our adult lives, the more we saw it necessary to preserve mystery, wonder and myth. Those elements were crucial to the alchemy of our childhood and where our imagination could lead us. When I was a boy I made treasure maps so my friends and I could play Goonies. Imagine our elation when one day we actually dug up an antique. Imagination and hope had led us there. My first official ghost hunt occurred when I was 12. 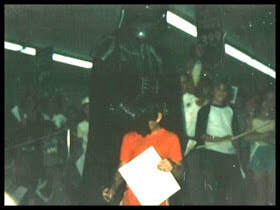 I had only a Polaroid camera and a ghettoblaster. I took notes, interviews, and sprinkled flour around the area where the table and chairs were reported to move. From this I got my first EVP of a grandfather clock the occupants didn't own. I was already aware of fault lines and how subtle vibrations could move things about. Regardless, I gave the unknown a wide berth and I expected the unexpected. I often wish I could go back to that time, when Halloweens were almost palpably magic, when every popular television show had to have their own "haunted" episode, from Charlie's Angels to The Bionic Woman, from The Incredible Hulk to The Greatest American Hero. Back then all it took to suggest something supernatural was happening was a swaying chandelier, flickering candles, a lightning storm, eerily-lit oil paintings, billowing curtains and creaking doors, perhaps some moaning and some chains. Every show had these things. It didn't take much to get one in the mood. I miss that innocence, romanticism, simplicity and storybook mystery. I think we will be going back to an extent, with our intent and with our image. A yin / yang of spirits. One pulled backward to the past and one moving into the future. I knew we would have to put future somewhere in the title to suggest there actually is a future for those in our field of study once the programs go into hibernation again. Yet every year I think the shows will die out, they become more popular than ever. Still, I miss the programs of the past, the way they saw the present and the way they saw the future. Tapping into a retroactive current, embracing the past while moving into tomorrow. I always wanted to be more than just the cookie-cutter team of 5.5 plus one medium, operating only within the empirical. We never joined any branches of Ghost Hunters or Ghost Adventures. We did our own thing, recruited who we wanted to suit the needs of the "investigation". Perhaps just changing the vocabulary from investigation to exploration, from evidence to something more evocative, more stimulating than a standard judicial term. Something encompassing more than just the paranormal, an umbrella term for a team of adventurers willing to apply full consciousness to all of their encounters. Once, hours after a ghost hunt we hosted at the Williams Stables in Central City, I had to return to put some chairs back on the upper floor. I was upstairs, all the way at the back of the building when I realized I hadn't switched the lights on. I was so used to moving about in the dark with our FLIRS and full spectrum cameras that I simply forgot to turn on the lights. I had found my way in the dark, alone, feeling perfectly fine, without any fear or hesitation. Everything already seemed illuminated and when I think back on that experience I don't remember the darkness at all. I was willing to not attach any negative connotations to something I couldn't see. My primary animal totem is the bat, and I truly understood the symbology behind echolocation then. I had gone with the intention of hunting ghosts, but found illumination instead. Many times we come away from explorations with spiritual insights. Our most successful spirit photography sessions included a brief meditation beforehand, setting our intention before reaching for any gizmos. Native Americans believe there is a spirit in everything - the water, the wind, the fire, the earth. In a way you could call everything haunted. We have always tapped into the spirit of a location first and as such our name was always fitting. It is an essential element to what we do - the recognition of spirit, and just after finishing this paragraph, an old friend stopped by to gift me an owl feather, another confirmation of seeing in the dark, intuition and underworld associations. "We saw death, and we did what no other animal had done before. We dealt with it. We hit on the idea that death wasn't an end. It was a passage. Trying to make sense of the unknowable - what Joseph Campbell calls the "awakening of awe". "That awakening to the mystery of death, and therewith of life, which, more than physical transformation, elevated man above the level of beasts." Time to turn our flashlights off. My uncle reminded me that there is no word for goodbye in Sioux, so we simply wish you well as we move into a new era - of leadership, of thought, of action - as we christen ourselves FUTURE GHOST, and look forward to sharing all that we experience with you. "These words still ring so true and pertinent after all these years. Wishing our friends and fans in the paranormal community a very Happy Holiday from FUTURE GHOST ( hitherto The SpiritChasers )! Please tell me the truth; is there a Santa Claus?" "VIRGINIA, your little friends are wrong. They have been affected by the skepticism of a skeptical age. They do not believe except they see. They think that nothing can be which is not comprehensible by their little minds. All minds, Virginia, whether they be men’s or children’s, are little. In this great universe of ours man is a mere insect, an ant, in his intellect, as compared with the boundless world about him, as measured by the intelligence capable of grasping the whole of truth and knowledge. One of our fan-favorite stories is now available for listening on the Anything Ghost website. We have been devoted listeners since 2006 and are so honored to have one of our paranormal pieces featured. Since then, not a Halloween has gone by when we weren't anxiously anticipating Lex's next show and every season we have used the AG theme as our ringtone. Anytime that spooky melody began to go off on our phones, we knew it meant that some exciting paranormal proposal was about to be offered. You can listen on iTunes, Android or other formats by using the link below and looking for: "10. Christopher (Colorado, U.S.) – Shipping and Receiving Ghost". "Anything Ghost is a podcast (audio show) where the host, Lex Wahl, shares listener submitted personal paranormal experiences (ghost stories). Lex then adds his original background music and effects to enhance to the creepiness of the listening experience. Anything Ghost was the first of the personal-ghost-story audio shows when it hit the podcast scene in January of 2006--and it hasn’t stopped since. Over the years, Anything Ghost has developed a large dedicated audience…an audience for which, Anything Ghost takes full responsibility for the bedside lamp that’s left on. Join the mass of ghost story lovers, and jump right into listening to ghost stories from around the world Anything Ghost style..."
On Saturday, October 22nd, The SC partner with Blue Moon Haunted History Tours for one of their favorite yearly events. Join them in the Evergreen Cemetery's haunted Chapel, featured in a season two episode of My Ghost Story, for a showcase of spirit photography, EVP and video to get guests in the mood before leading them downstairs for a ghost hunt in the old morgue. Many of you have seen their Fox News interview from this very active location and have taken some very interesting photographs yourselves! More information on these events, as well as registration information, will be added to the following links below. In the meantime, mark your calendars and check back for updates! Here's this season's new title, in honor of Netflix's "Stranger Things". We absolutely loved this show and can't wait for more episodes! SpiritChasers X will be released this fall. This autumn marks our 10th anniversary and therefore our 10th episode of The SpiritChasers! Some of you have all 9 previous DVDs and have been to our live presentations and ghost hunts. We'll continue to keep you posted on our latest events and hope you join us this fall for an evening of celebration, storytelling and adventure! We recently returned from an adventurous weekend in the mysterious San Luis Valley. We had the honor of meeting Travis Walton at the UFO Watchtower's Under The Stars conference. He spoke about the truth behind his experience, far from what was depicted in the 1993 film Fire In The Sky ( recently added to Netflix ). He was gracious enough to sign a poster for The SpiritChasers, and his kind words helped to reinvest and reignite us on our esoteric journey throughout the unknown. Our many thanks to fellow adventurers Rebecca and Shawn, who helped make this trip truly delightful. We closed our active weekend with a long hike up to the remains of the New Town Of Orient, former home to a 1822 mining colony, abandoned in 1933. We sat in the crumbling foundations, taking photos and listening for echoes from the past. We ventured up to the collapsed mine, now home to a 250,000 Mexican Free Tail bat colony. We watched them leave their cave at dusk, filling the sky above us, the rush of their wings like the blessings of Tibetan prayer flags. Off into the sunset they disappeared, leaving another mystical experience which replenished our souls and granted us a new inertia. We are looking forward to the fall season, when we can share new stories, photos and findings from our latest adventures through the Underworld. As we approach our 10th anniversary this autumn, we hope you join us and experience some new stories of your own! Christopher: "I was working in the shipping and receiving department of an old downtown warehouse when we began to hear about this strange movie coming out. It was supposedly the found footage of three missing students who were investigating a local legend when they disappeared. The warehouse at one time housed an old speakeasy and several employees were reporting all manner of paranormal activity. No one wanted to go into the basement for anything. The noises always started late at night. We'd sit at our computers, waiting for the eventual door slamming or dragging noises to start floating up the stairs. All of the extra packing material was in the basement so we'd have to go in teams. When the film, The Blair Witch Project, was eventually released, no one knew it was just a movie. Due to a clever marketing campaign, we all thought we were watching a real documentary. I went on opening night with two people who would eventually join The SpiritChasers. Everyone in the audience was on the edge of their seat the entire duration of the film and never before had a movie affected me in such a way. Eventually it was revealed that the missing students were in fact paid actors, but by then we were already collecting and distributing Blair Witch trading cards at work. The activity seemed to increase, as if feeding on a new fear of the unknown in our collective unconscious. The ghost stories were scarier, more alive, and television began to become saturated with paranormal programs and specials. The Scariest Places On Earth, one of our favorites, debuted the following year in 2000. Ghost Hunters followed four years later and a couple years after that The SpiritChasers were born. I always look back on that time period, that new golden age of the unexplained, with gratitude and awe, when doors began opening up for us ( sometimes literally ) and new questions were being asked I had grown up watching In Search Of with my father, reading Ed & Lorraine Warren throughout elementary school, then discovering Arthur C. Clarke's Mysterious World, then Unsolved Mysteries, then SyFy's Sightings. My first official ghosthunt actually occurred when I was 12. The SpiritChasers became a natural extension of everything I had already been experiencing, preparing me for new adventures, unknowns and philosophy. It seems fitting that this fall we will celebrate our 10th anniversary as a paranormal investigation team, just as the new Blair Witch movie will be released. We will be back in the theater opening night with our original team members, hopefully as enraptured as before, afterward raising a glass to everything and everyone who conspired to make The SC a reality. Tonight The SpiritChasers return to international airwaves with the Japan airing of Fuji TV's "What's This? - Mysteries From Around The World"! "The world is full of mysteries, despite the leaps of advancement humankind has made in technology over the years. From UFOs to mysterious creatures to the supernatural, we took it upon ourselves to explore the incomprehensible mysteries around the globe. Your hosts Kyary Pamyu Pamyu and comedian duo Ameagari Kesshitai will take you on a thrilling rollercoaster ride through the madness of it all!" One of the stories, shot by The SpiritChasers - featuring original music composed by Christopher Allen Brewer - includes photographs from investigations they held at Cheesman Park. Originally, interviews for this story were filmed by Christopher and his cousin Denise in L.A. in 2012 for the Biography Channel's "My Ghost Story". When BIO sold the program to Lifetime Movie Network, the show went on indefinite hiatus. 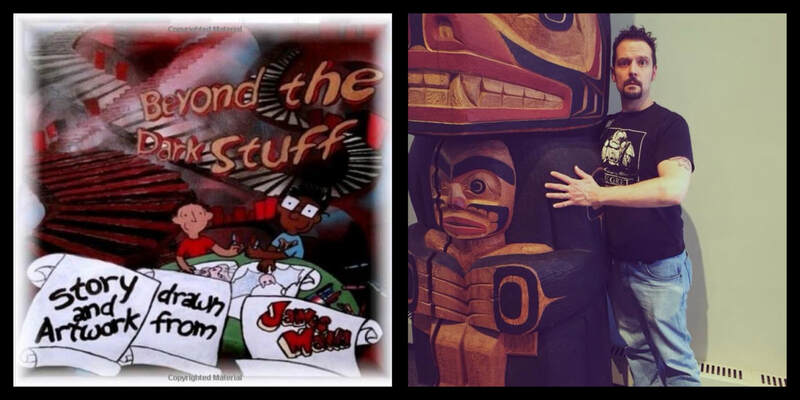 Only the "Whispering Walls" segment from Cave Of The Winds featuring James and Christopher was aired ( episode #30 - Paranormal Studies ), now available on iTunes and Amazon ( and still airing on Australian TV ). So, for those of you who are able, tune in from 7:57 to 8:54 this evening for What's This?! Click here for the Fuji TV website! Our main Spirit Photographer, James Manda, just took this photo of an interesting cloud formation near Crystal Hills Cemetery. We ran it through an IR filter afterward. Ghosts, archangels / ascended masters or just pareidolia? Whatever you're seeing out there in the skies today, stay hydrated. It's another hot one. Have a great weekend! ﻿﻿Should some truly genuine, smoking gun footage of the paranormal surface tomorrow, what do you think the reaction would be? Debunkers unite? Because we live in an age of miracles, but people don't feel the self-worth to expect them. We ask for them, but back away from them as they always arrive in unexpected, uncontrollable, unforeseen ways. We live in an age where people would rather tear them apart, or tear others apart for their beliefs. If we're not able to manifest a genuine miracle, we don't want to see anyone else doing so either. People have to live in a controlled environment. Enter the debunkers. The homemade, instant armchair scientists. This is a time of great polarization and division of our people. Anything nowadays is game. Endlessly debatable over social media. The following footage has been torn apart ever since its release. It helped along myth, a story, both of which are unstoppable. Some myths need to be put to rest, for sure, but if they create belief in something which sparks passionate interest, out-of-the-box thinking and spiritual advancement, you'd do well to give it a wide berth. People are ridiculed for their belief in fairies, yet in Ireland, where Halloween originated ( the largest paranormal holiday for those in our field ), fairies are an important, essential component - so much so that "fairy mounds" still hold a tremendous amount of power and construction is still bent around them. Debunkers will forever claim ghost hunters are simply photographing no more than insects, dust or other easily identifiable phenomena. Many naysayers play a necessary and pivotal role, others could use a good lesson on the wise investment of energy. Regardless, you can count on us to be on the other side of the field. "I WANT TO BELIEVE" is the caption on a poster in one of our favorite detective's office. I think we're discerning enough to believe with full awareness and consciousness. It takes nothing to hold a thoughtform in your mind, to turn it over and ponder it. Belief is an investment of energy. It can activate a myth. We choose to believe. We choose to invest. We expect miracles, and therefore we are sometimes granted them. New clips added to our Videos page! ​Every October The SpiritChasers release an evidence reveal consisting of all the photos, footage and EVPs gathered since the last season. Here are some segments from last Halloween's episode, "SPIRITCHASERS 9", as well as some clips from the interview The SpiritChasers did with The Denver Post back in 2013. Christopher Allen Brewer and James Manda of The SpiritChasers join such Colorado luminaries as past and present mayors, senators, scientists, journalists and several other prominent figures filming an interview with then Denver Post Editor-In-Chief, Greg Moore. Their cameraman, Craig Walker, was also a 2-time Pulitzer award winner. Click here for our Videos page! Click here for YouTube video link! One of our honorary members is a Borden blood relative. A very compelling news story, and a thrilling modern ghost story. Especially interesting is the way these reports were documented. The SpiritChasers recently revisited the newly reopened Lantern Tour at Cave Of The Winds. This is the infamous “ghost story” tour featured in our episode of Lifetime Movie Network’s “My Ghost Story”. During a certain part of the tour, the guide will talk about one of the owner’s former wives, Nellie, how she is often seen in a white lace dress sitting on one of the upper shelf formations. These photos were taken with a full-spectrum camera, capable of “seeing” beyond the infrared. Is this her? Special thanks to Rebecca and Shawn, two of our dearest friends and fellow adventurers! Click here to view the "My Ghost Story" episode#30! As paranormal investigators, 2015 was a spectacular year for us and we're very grateful for each and every glimpse through the veil we've had. Special thanks to Stephanie and Wesley Waters, Robert Rais, Rebecca Hoffman, Sean Borden, Brett Leal and YOU for allowing us to share our stories and helping to create new ones. We are indebted to you for your interest and support. May 2016 be a very fulfilling and enlightening year for us all! Courtesy of Christopher's cousin Kim, who experienced many of the same hauntings he did growing up, we have this photo for your consideration. 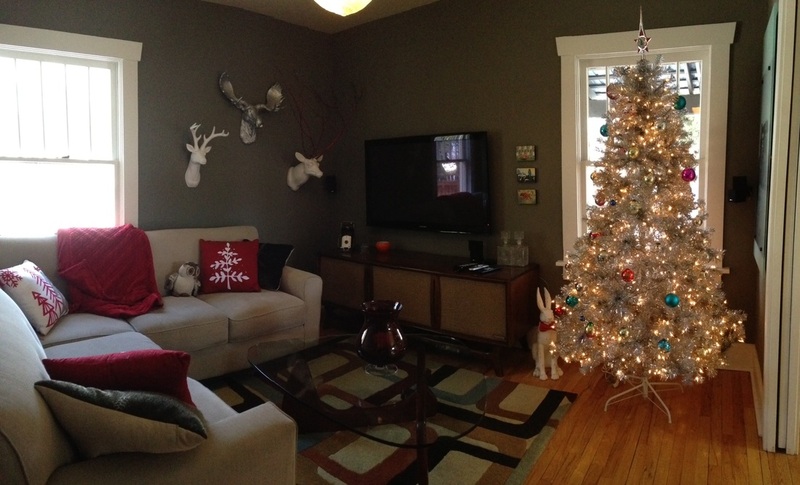 Kim recently decorated her home for the holidays and noticed something odd in the reflection of her television set. Parts of her home are currently being remodeled and her children are now at that age where poltergeist-like manifestations can happen. Looks like the Christmas Spirits are visiting a little early this year! Thank you, Kim! Although the busy fall season has ended, as we move further into darkness the veil between worlds remains just as thin, straight into the holidays when departed ancestors are hearing their names being spoken during holiday dinners or seeing the spirit plates left out for them. Even the Christmas carol "It's the Most Wonderful Time of the Year" references the "scary ghost stories" told during this season when everything in nature appears to die or head into a long sleep. Most paranormal groups would agree that ghost hunting is a full-time occupation and despite a decrease in events and invitations, they will remain active themselves year-round. Such is the case with us. We are still working behind the scenes on our first book of paranormal experiences and spirit photography, our SpiritChasers 10th Anniversary Special, plus other exciting projects. Until then, please look to our Facebook page for the latest updates and news reports. It's been a very rewarding season and we remain grateful for your support and interest! Introducing Christopher's Halloween labor of love, The LEGO SpiritChasers Cheesman Park Playset! Visit our HUMOR page or click the link below for the full album. We hope to spook you this season! Click here to view the playset! Mark your calendars, some very exciting events have been announced for October! The SpiritChasers will be participating in a Real ghost Stories class at the Celebration Community Room on Saturday, October 17th, the yearly haunted history walk at the Evergreen Cemetery on Saturday, October 24th, a media presentation at the Celebration Community Room On Friday, October 30th and a ghost hunt / media presentation / séance at the City Auditorium on Halloween night! Watching a collection of our spirit photography and videos in a haunted chapel before embarking on a ghost hunt in the morgue and a haunted history walk in the Evergreen Cemetery has been a fan favorite for the last 3 years. This will also be our second year at the historic City Auditorium and entertainment will include a media presentation at the haunted Lon Chaney Theater, a ghost hunt in the basement and a séance! The Celebration Conscious Living Store Community room is also an ideal way to check out our body of work in a more private, intimate setting. This particular presentation has sold out the last 3 times we have held this event there. More information on these events including registration can be found shortly by following the links below. We hope to scare you there! Our official, personalized bottles from Coca-Cola. These ( and some promotional glossy stickers, plus a ghost box ) will serve as limited-edition giveaways at September's paranormal convention in Cripple Creek during the weekend of the 18th. We will be holding a special media presentation Saturday the 19th from 4:20 to 5:15:pm, as well as hosting ghost hunts at the infamous Maggie's restaurant beginning at 10:pm. Plus, we've booked the most haunted room at the Imperial Hotel! Visit the link below and register asap, it's sure to be unforgettable. Be there and be scared! Excerpts from a 2012 radio interview have been added to the “About Us” page, including The SpiritChasers’ views on debunking, ghost hunting tools, their paranormal backgrounds and credibility vs. celebrity. Click the link below to read more. The following photo was taken on the evening of July's Blue Moon by our established spirit photographer James Manda. We had a full spectrum camera with us that night and this particular photo was taken at the site of intense psychic residual energy. There were 4 "figures" altogether. We have really been enjoying this camera, which is very similar to a GoPro and is still on sale at GhostStop.com! The SpiritChasers were granted an audience with MAX over the weekend, one of the 13 legendary ancient crystal skulls. Thousands of years old and believed to be one of the oldest artifacts ever discovered on earth, this encounter was truly unforgettable. Read all about their experience by clicking the BlogSpot link below! ﻿﻿This will be our 4th year as featured speakers at this very exciting and supernaturally stimulating event. Be there and be scared! The 4th annual Spirits of Colorado Paranormal Convention and Slumber Party! $15.00 Registration Fee will be waved if you make reservations to spend the night at hotel. Please call hotel directly in order to reserve your room. THE TRUTH IS OUT THERE. Christopher and James meeting Mitch Pileggi ( Walter Skinner from The X-Files ) at Denver Comic Con last May. Who else is excited about the return of Mulder & Scully next January 24th? Production officially began in June on six new episodes of the series. Christopher: There's a long, scenic stretch of road in between Castle Rock and Colorado Springs. Lots of curves, valleys and grassy hills. Every time I've ever driven in this area at night, I always think how it would be such an ideal place for a UFO landing because there are so many isolated stretches of land. James and I were driving home from a U2 concert in Denver last Saturday night, a little after midnight, when we were passing through this area. I turned to James and told him that I always felt UFO energy around here when suddenly, all the interior lights in my car blazed on. This has never happened in all the years I have owned my car. My eyes darted about the windows and I immediately scanned the skies for anything unusual. We were the only ones on the road, there was no other movement. James scrambled to manually turn off the lights while I kept my eyes on the digital clock, fully expecting to begin losing time. I began repeating the time then turned to James again after a moment, breathless and enthralled. It had gotten so quiet, so still, so black outside the windows save for a gigantic waning moon coming up over a volcano-shaped hill. I asked James if we were really seeing the moon or if this was a real-time screen memory of something else. He asked in his most innocent voice if I thought our electrical trouble could have been a UFO. Instantly, all the lights blazed back on again. The glove compartment light blinked on and off for a bit after James once again turned the lights back off. It was very unsettling. I felt something was trying to communicate with us. I focused on the road ahead, thinking perhaps it was a warning from a messenger, we had after all been talking about Mercury / Hermes just moments before. What was the message? To pay attention? Or was there another intelligence listening, assuring us it was indeed part of our reality? We made it back to Manitou with no further incidents, no accidents, no danger. At home I passed by my bookcase full of material and media on the UFO phenomenon. Photos I had taken with Linda Moulton Howe, Christopher O'Brien, John Burroughs of the Rendlesham Forest Incident and Whitley Strieber sat in small frames on the shelves. Above them was our newest addition, the picture we took with Mitch Pileggi. I looked up at our smiling faces and caught the scent of a far off Indian summer on the evening wind. Our archetypes had returned, the seekers of hidden wisdom, to remind us it was once again time to step back into dark places, to ignite the light of higher knowledge. The truth was out there. And we intended to find it. Many of you have seen our episode of BIO's "My Ghost Story" that was filmed at Cave Of The Winds. Did you know we also filmed another episode at Cheesman Park? Shortly after filming in My Ghost Story's Los Angeles studio, Christopher was again flown back to film another interview with his cousin regarding their paranormal experiences at Cheesman. A cameraman was later dispatched to join them at this former cemetery, which was the inspiration for 1982's Poltergeist. Another film, 1980's The Changeling, consisted of yet another story based in the Cheesman neighborhood. With the new Poltergeist reboot arriving in theaters today, we thought it appropriate to share with you two of Christopher's blogs concerning the Cheesman legend, including photos taken during the filming of his second My Ghost Story episode there, as well as the spirit photography The SpiritChasers have captured in this very paranormally active park. Cheesman Park : Personal Experiences and Cheesman Park : A Gruesome History, can be viewed by following the link below. Let us know if you plan on seeing the new movie and if so, what your thoughts were! James Manda's colorful new book, which he wrote and illustrated himself, is now available for purchase on Amazon. It is the heartfelt story of a child coping with the death of his beloved pet. It is very endearing and very kid-friendly! Click the link below for more information. He is tremendously ecstatic and we are tremendously excited for him! "Poltergeist Will Help You Find Out Who Died in YOUR House"
This is actually a clever little generator. We're admittedly a little nervous to use it! A new blog entitled "Give" has just been added concerning the way we as ghosthunters often take from investigations without offering. What are you willing to do to appease the unseen? Click on the link below for one such story of ours! "Haunted Indian Fort Frightens Filmmakers"
And the ghosts of Christmas past, present and future to guide us. Hoping everyone plays nice next year, here's to peace on earth and goodwill toward men and women. Happy Holidays from The SpiritChasers! A perfect read for this time of year regarding a mostly forgotten tradition. "The Origins of Ghost Stories at Christmas"
As many paranormal researchers know, business tends to die down after Halloween, when it gets too cold to be out in drafty buildings or outdoors after dark. This doesn't mean paranormal phenomena decreases. As we move into further darkness the veil remains just as thin, straight into the holidays when departed ancestors are hearing their names being spoken during holiday dinners or seeing the spirit plates left out for them. Even the Christmas carol "It's the Most Wonderful Time of the Year" references the "scary ghost stories" told during this season when everything in nature appears to die or head into a long sleep. Most paranormal groups would agree that ghost hunting is a full-time occupation and despite a decrease in events and invitations, they will remain active themselves year-round. Such is the case with us. As Christopher works in retail, his focus is on the heavy sales occurring during this time, leading up to Black Friday and on through Christmas. After inventory and reflection on the year behind, he shifts gears as his dreamtime becomes more vivid and preminatory. From that period onward, we have officially clocked back in. Until then, please look to our Facebook page for the latest updates and news reports. It's been a very rewarding season and we remain grateful for your support and interest! -----------------------------------------------------------------------------------------------------------------------------------------------------------HALLOWEEN IS HERE! Paranormal investigators everywhere are currently charging millions of devices used to pierce that legendary veil between realms. Our busiest season is coming to a close, but not before one last attempt at communication with the otherworld. We've all had good nights and bad nights in the field. Here are some of our good ones. We are utterly grateful for all of the support and opportunities we have been granted with over the years and we send para-love and good luck out to all the investigators trying to part that infamous veil this evening. Feel the love! On Thursday, October 23rd at 8:am, The SpiritChasers will be joining paranormal author and haunted historian Stephanie Waters on Kilo 94.3 to promote our upcoming events! Stephanie is a master storyteller and utter riot and as one of our best boo buddies we've had some very memorable experiences on the air. And remember, our big media presentation / paranormal evidence reveal is this Friday at 7:pm at the Celebration Community Room in Old Colorado City. Visit the store website ( www.celebrationstore.com ) or our event page for more info. We surely hope to see you there! Happy October! We have many great events lined up this month including ghost hunts at the Evergreen Cemetery Chapel, the City Auditorium, 2 media presentations at the Celebration Community Room, 2 free classes at their Halloween fair and more! View our Events page for the latest updates! "10Best: Most Haunted Spots in the USA"
We've been to 2 of these. How many have you been to? "Top 13 Haunted House Favorites"
One of the haunted houses featured is The Changeling house, a very real structure which was actually located down the street from Cheesman Park. From the official SyFy Paranormal Witness website, one of our stories is about 16 down. So great to be acknowledged! "13 Scary-As-Hell Places in America"
ENJOY A SPINE-TINGLING, SUPERNATURALLY STIMULATING PRESENTATION FROM ONE OF THE MOST PROMINENT AND UNIQUE PARANORMAL INVESTIGATION TEAMS IN COLORADO. SEE SOME OF THE MOST CONVINCING FOOTAGE AND PHOTOS OF THE OTHERWORLDLY AND UNEXPLAINED. LISTEN TO HAIR-RAISING STORIES AND CHILLING EVP’S GATHERED FROM THEIR MANY YEARS IN THE PARANORMAL FIELD. LEARN WHICH METHODS AND TOOLS GET THE BEST RESULTS ON AN INVESTIGATION AND HOW TO RELEASE UNWANTED ENERGIES FROM YOUR ENVIRONMENT. FROM BUDDING GHIOST HUNTERS TO THE ADVANCED TO ANYONE WHO HAS EXPERIENCED PARANORMAL ACTIVITY, OR THOSE WHO JUST LOVE A CHILL DOWN THEIR SPINE, THIS EVENT IS A PERFECT WAY TO GET READY FOR HALLOWEEN, WHEN THE VEIL BETWEEN WORLDS IS AT ITS MOST THIN. A CLASSICALLY SPOOKY EVENT, BE THERE AND BE SCARED! CHRISTOPHER ALLEN BREWER, AN OGLALA SIOUX, FOUNDED THE SPIRITCHASERS IN 2007 WITH JAMES MANDA. THEIR EVIDENCE HAS BEEN FEATURED ON EPISODES OF THE BIOGRAPHY CHANNEL’S “MY GHOST STORY”, FOX 21 NEWS, THE DENVER POST, AND THE SYFY CHANNEL. THEY HAVE APPEARED ON NUMEROUS RADIO PROGRAMS AND BOOKS AND HAVE PARTICIPATED IN MANY POPULAR PARANORMAL CONVENTIONS, RETREATS AND GHOST WALKS. THEY WILL BE SHARING THEIR LATEST FINDINGS FROM THE FIELD AS WELL AS REVEALING ACTUAL LOCATIONS YOU CAN VISIT IN THE ‘SPRINGS FOR ANYONE SEEKING OUT THE SUPERNATURAL THEMSELVES. JOIN THEM ON THEIR ADVENTURES THROUGH THE UNDERWORLD AS THIS UNIQUE PARANORMAL INVESTIGATION TEAM PARTS THE VEIL TO BRING THEIR STUNNING EVIDENCE OF THE AFTERLIFE ( AND EXTRA-DIMENSIONAL ) WITH YOU! The Celebration Community Room is located adjacent to the Celebration Metaphysical Store at 2209 W. Colorado Ave. in Old Colorado City. Store hours are Monday - Thursday from 11:am to 6:pm, Friday & Saturday from 10:am to 6:pm and Sunday from noon to 5:pm. Call them at ( 719 ) 634-1855 or visit their website by clicking the link below to register for this very exciting event! Dear McDonald's, PLEASE MAKE THESE AVAILABLE NOW! THIS WEEKEND! The Third Annual Spirits of Colorado Paranormal Convention in Central City, Colorado! James and Christopher from The SpiritChasers will not only be holding a video presentation in one of the spookier buildings there, but will also be holding a ghost hunt at the Williams Stables later that evening. If you haven't already registered yet please do so! Join us in the haunted heart of Colorado for this unique event. Meet keynote speakers from from radio and television, celebrated authors, noted psychics, and various paranormal celebrities from "Day of the Dead","My Ghost Story", "Ghost Adventurers", and "The Paranormal Challenge." Pre-Purchase registration for $15.00 and an autographed copy of "Colorado Legends and Lore", can be yours at wholesale price of just $10. This spooky, keepsake book features over 30 haunted tales with historic illustrations. Many of our hosts are featured in this new anthology; which will sale for $17.00 at the convention. Early Bird registration insures your reservation and gives you priority seating, if rooms are at capacity. Hurry and Register Now - Registration at the door does not include these special savings or advantages. Special prices on wine, well and Beer. Meet local legends and legendary ghosts! Play the paranormal challenge game and win prizes! Come for one day or stay the entire weekend! All seminars and events are priced separately and payable directly to the instructor at the door. All seminars are about an hour long and cost 5.00 each, CASH ONLY, PLEASE. Approximately six venues and thirty choices within one block walking distance. There will a half hour interval between each event. Historical tours presented by the B.P.O. Elk's Club and the Gilpin County Historical Society, will be featured throughout the day. Evening Events Run between 60 to 90 minutes and will cost $5.00-10.00 each. Professional Paranormal Investigations will be held at various locations. There will be an old morgue seance, cemetery walk, and haunted history tours. All events and sessions are cash only and will be paid directly to the presenter. Professional psychic readers are priced individually. This is an image we took a few years back at one of our favorite haunted hotspots. After we enlarged the orb and ran it through an infrared filter we noticed some interesting details. On a UFO skywatch once with author Christopher O'Brien, Christopher was told to suspend any assumptions he had about the paranormal and to view things with a higher perception. He was told to try imagining these unidentified lights in the sky as not simply otherworldly craft but perhaps a point of light connecting our dimension to another. Perhaps this is what we're seeing within this orb, simply a hole between dimensions where the faces of two beings are looking right back at us. For more of our photos, go to our Postcards From The Paranormal photo gallery page. "America's Creepiest Abandoned Amusement Park To Open For One Week Only"
This event is just right around the corner. Will you be joining us? The SpiritChasers will be giving a special video presentation in the afternoon as well as helping out with the séance and various other activities. Have you ever wanted to talk to the dead? Are you fascinated with Angels, Ghosts, UFOS, Bigfoot, and all things paranormal? Do your old friends think you're weird? Do you want to make new friends? Then join us in the haunted heart of Colorado for this unique event. Meet keynote speakers from from radio and television, celebrated authors, noted psychics, and various paranormal celebrities from "Day of the Dead","My Ghost Story", "Ghost Adventurers", and "The Paranormal Challenge." "Spooky Ghost Video 'Freaking Out' Employees At Ellacoya Country Store"
"Top 15 Real Ghost Pictures and Videos"
"R.I.P. Frank Sumption. The Inventor of the Spirit Box Leaves Us." "10 Creepy, Haunted Objects with a Hidden Past"
"Fire Destroys The Myrtles Plantation Gift Shop"
"TV Reporters Claim They Were Attacked By Ghosts in Haunted House"
"Renter Shocked to Learn Home's Dark History"
Top left : Christopher with Emmy Award-winning investigative journalist and author Linda Moulton Howe. This documentary producer-writer-director-editor's riveting reports on high strangeness are featured each week on Earthfiles.com. Top right: With retired Sgt. John Burroughs. His new book, Encounter At Rendlesham, explores the legendary tale of the bizarre events witnessed by dozens of USAF personnel just outside an English Royal Air Force base. Bottom left: With author and investigator Christopher O'Brien, whose books shed light on the strange mysteries taking place in Colorado's San Luis Valley. Bottom right: With local paranormal author and investigator Stephanie Waters, owner and operator of Blue Moon Haunted History Tours. I have always been influenced by great detectives in print ( Batman, for example ), and in cinema, those in search of hidden knowledge ( Clarice Starling, Scully & Mulder, D'anna Biers, Indiana Jones ). The demonization of "that which is hidden" and other forbidden fruit only made me even more curious to know exactly why some things weren't so easily revealed. As a child it began with Christmas presents and dark cellars and as I matured it became ancient knowledge and haunted houses ( more dark cellars ). I love a good mystery, especially those that lie outside the boundary of the easily explicable - the supernatural. Thankfully, pioneers like demonologists Ed & Lorraine Warren had published plenty for me to read in my elementary school library. Believe it or not, my school featured a pretty large occult section back in the early 80's and I took full advantage of it. One of my favorite quotes comes from a novel and miniseries by Shirley MacLaine: "In order to get to the fruit of the tree, you have to go out on a limb." James and I, with musician and investigator Brett Leal, did so last summer, during a late-night skywatch with Christopher O'Brien near the Great Sand Dunes National Park. My idea was that we had to offer our fear to the night before we could glimpse any of it's secrets. So, sacrificing our fear, we took a dangerous night hike up through Zapata Falls. Walking up the rocky trail with unseen creatures and who knows what else making noises in the darkness consuming us, we at last entered a cavernous space of rock. From here we waded through the icy waters of the Rio Grande, over slippery moss-covered stones, with the deafening roar from the 25-foot waterfall at the end of the crevasse. It was like walking into the mouth of an angry giant, bellowing as our flashlight lit up the powerful falls above us. Upon returning I glanced back at the mountainous terrain we had just left. Did I just see a red spark shooting up out of the mountains? Another observer also claimed to have, then Christopher O'Brien mentioned that people had seen the sky above Zapata full of strange, bobbing red orbs. From the red Maltese crosses the conquistadors traveling through this area marked their buried treasure with, to the unidentified craft regularly spotted in the the San Luis skies, to the unknown lifeforms known as "prairie lizards" spotted phasing in and out of this dimension on the roads here, this is a place of great mystery. I am grateful to have stood next to so many courageous souls over the years who have ventured into the darkness and emerged with great treasures of wisdom. I wish you the same bravery in your own pursuits and hope you come back with only the sweetest fruit. "Ghost Photographed at a Cemetery That 'A Nightmare on Elm Street' Was Filmed At"
"'Cursed' Mansion Once Owned By Leona Helmsley is Listed at $65 Million"
Christopher Allen Brewer and James Manda of The SpiritChasers join such Colorado luminaries as past and present mayors, senators, scientists, journalists and several other prominent figures filming an interview with Denver Post Editor-In-Chief, Greg Moore. Even their cameraman, Craig Walker, was a 2-time Pulitzer award winner. Click the button below to view and have a Happy Thursday! "Haunted House For Sale...Who's Buying?" From 2012: SpiritChasers Christopher and James appear on national television in the Biography Channel's My Ghost Story episode #30 ( Paranormal Studies 101 ) in the segment entitled "Whispering Winds". In January they were flown out to L.A. for their studio interview, then a cameraman was dispatched to them in Manitou where they filmed from 12-9pm, deep underground at the Cave Of The Winds attraction where their story took place. Christopher, along with his cousin Denise and friend Julie, was flown out for another studio interview in L.A. soon after. Once again, another camerman was sent to meet him at a former cemetery - Cheesman Park in Denver - where he and his cousin shared another paranormal experience. This episode has yet to air as My Ghost Story was sold to the Lifetime Movie Network and is currently on hiatus, but episode #30 "Paranormal Studies 101" can be purchased through iTunes or Amazon. "Haunted Hollywood: The 'Poltergeist' Curse"
The Third Annual Spirits of Colorado Paranormal Convention and Supernatural Slumber Party! Central City has been called the richest square mile on earth but did you know the former mining camp is also very haunted? Meet professional authors, lecturers, psychics, ghost hunters, UFO experts, Sasquatch enthusiasts and paranormal celebrities! Over thirty events offered at six different venues! Each class or event is priced individually making this the most affordable paranormal convention offered anywhere in the United States! Friday night will be an optional haunted happy hour. Hour long paranormal classes and workshops will be held from noon to midnight on Saturday. Evening events will include paranormal investigations, cemetery ghost walk, haunted history walking tour and midnight seance. Optional Sunday morning breakfast will be held at Millie's from 8:00-10:00. $10.00 Registration fee or $25.00 a couple which would include an autographed copy of the new book "Colorado Legends and Lore." which retails for 16.99. Early bird registration includes an event program, keepsake bracelet and special hotel discounts. Registration will be $15.00 on the day of the event. Hour long daytime classes will be $5.00 each and will be paid directly to the instructor. Evening paranormal investigations, ghost walks and midnight séance will be $5.00-$10.00. Psychic readings will be priced individually. Cash only. "10 Haunted Hotels Where You Can Check-In (and Hopefully Check-Out)"
"Facebook User Being Haunted by Girlfriend Online... Fact or Faked?" This is a photo James and Christopher captured of what they believe to be the spirit of a Ute Indian chief. They took the photo in the legendary Ute entrance to the Underworld at Cave Of The Winds in Manitou Springs. Dare to take their Lantern Tour and see what results you get yourself! "Fact Check: Are These Horror Films Really 'Based On Actual Events'?" "What This Boy Photographed On A Field Trip To A Cemetery Will Send Shivers Down Your Spine"
"10 Most Compelling Pieces Of Evidence That Prove Ghosts Are Real"
"Considering A Haunted House Buy? 'Don't,' Says Carmen Reed"
"Is This Dracula's Real Tomb?" "Another Brutal Knife Attack Blamed on Slender Man"
"Famous Downtown Ghost Strikes Again"
"Ancient Curse On Utah Park Is Real, Say Visitors"
"Dig At Halloween Ritual Site To Get Under Way"
"One Of America's Most Haunted Mental Hospitals Shuts Down Ghost Hunters"
"An Actual Recording Of Arthur Conan Doyle's "Spirit" From A 1934 Séance"
"Historic Mansion Is Shockingly Cheap - But There's A Big Catch"
"Dracula's Castle Up For Sale"
"Meet The Real Life Christine - The Most Evil Car In America"
"The Quiet Ones - Witness The Films True Events"
One of our first radio interviews with a man directly affected by an airline tragedy we were investigating. It was a classic "needle off the record" moment when we learned of this synchronicity on-air. Years later, we would meet another man who was in the hangar and brought us actual pieces of the airplane in question. It remains one of our most rewarding and compelling investigations. "The Most Haunted Place In The World Is For Sale"
"7 Terrifying Cursed Objects That Actually Exist"
"How To Get Rid Of a Ghost: 3 Easy Ways"
"University Lecturer Claims To Have Photographed Real-life Tiny Tinkerbells Flying Through The Air In The British Countryside"
"Ghost Hunters To Investigate Gilford Store Surveillance Video"
Some very compelling footage from our investigation of the Croke-Patterson Mansion last year, with Christopher, James, Brett Leal ( Happy Birthday! ) and medium Debi Lundquist. Enjoy! "The 10 Most Haunted Places In The World"
"Ten Spooky Curses That Were Debunked With Really Simple Science"
A Fun Fox 21 News Interview With Christopher At A Haunted Chapel A Couple Years Back. Special Thanks To Paranormal Author Stephanie Waters For Thinking Of Us! "Night Terrors: The Real Reasons Why You Wake Up Screaming"
"Sony Bringing Elisa Lam's Haunting And Frightening Tale To The Big Screen"
"Embracing Spiritual Gifts And The Mystery Of The Paranormal"
"Ye Olde Man And Scythe Ghost Video: Was CCTV A Real Haunting Or Just A PUBlicity Stunt?" "Watch The Creepy Moment A 'Thirsty Ghost' Smashes Wine Bottles And Glasses At A Haunted Hotel"
"Watch Chilling Footage Of Ghost Caught On CCTV At One Of UK's Oldest Pubs"
"An Occult History Of The Television Set"
"Workers Discover More Than 1,000 Corpses At Site Of Old Mental Asylum"
"Welcome To Helltown, Ohio - The Abandoned Town Filled With Ghosts and Legends"
"Inventive And Adorable : Animated Ghost Stories"
"Haunted Maya Underwater Cave Holds Human Bones"
"Pennsylvania Couple Advertises Home As Slightly Haunted"
"Has 'Creepypasta' Reinvented Folklore For The 21st Century?" "What Do You Believe About Ghosts? A Self-Assessment"
"Ghosthunters Busted For Burglary In Gettysburg"
Fellow ghost hunters might want to know that this calendar has so far proved invaluable to our team. Apart from keeping track of upcoming investigations and collaboratory events, each month's haunted castle features not only a brief history of the locale, but a few of its ghost stories as well. What we'd really love to see, however, would be an America's Scariest Places Calendar, something featuring Waverly Hills Sanatorium, the Queen Mary, Stanley Hotel and others. What locations would be in your scariest places calendar? ( Ours would be Devil's Bridge, in the Secrurity / Widefield area - for more info about this grim and perplexing spot, pick up a copy of Stephanie Waters' Ghosts Of Colorado Springs And Pikes Peak )! "Telling Ghost Stories Is A Lost Tradition On Christmas Eve"
"Ghost Hunters Burn Down Historic Mansion"
The following article is a clear example of exactly why many paranormal investigators have such a bad name. It also mentions other tragedies related to ghost hunting. Don't get us started about bloody amateur "investigators" popping up right and left with zero tact or respect for their environment, their associates, the paranormal community in general and the spirits behind the phenomenon. Even the smallest transgressions in this field of research have a way of spreading. People have done irreparable damage to their reputations without even realizing it and yet still claim to be "professionals". If you are damaging property, challenging and fighting with other paranormal teams, destroying the credibility of other colleagues or just being all-around insecure divas you are not "professional" and are only adding to the sideshow that has become paranormal research. "An Abandoned, Believed Haunted, NASA Launch Site You Can Actually Visit"
"13 Places On Earth Thought To Be Entrances To Hell"
"Wonderful Castles And Mansions That Are Haunted By Tragic Ghosts"
"Why Do Human Beings Seek Out Terrifying Experiences?" "The Spooky TV Movie That Caused Post-Traumatic Stress Disorder"
Our presentation the night before Halloween at the Celebration Metaphysical Center was immensely fun and we look forward to doing more in the future. 2 hours was not near enough time to share everything we wanted to but we're hoping everyone left with the sense of wonder, awe and the appreciation and preservation of mystery that inspires everything we do. Huge thanks to all of our guests and to those of you who shared your own stories with us. On Halloween we also joined Greg Moore, the Denver Post's Editor-In-Chief, for an Editor's Desk Halloween podcast. Greg was warm, humorous and genuinely interested, we couldn't have asked for a better host and we are grateful for the opportunity. The Denver Post offices were amazing as were the many Pulitzers they have been awarded over the years, and our cameraman, Craig Walker, was in fact awarded two of his own. Special thanks to Bellaire, Ohio's Witchtalk Radio for having us on the air! Christopher met Kristin Lee, one of it's founders, while in L.A. last year filming his first interview for the Biography Channel's ( now the Lifetime Movie Network's ) popular program My Ghost Story. We also had a blast on Kilo Radio with author Stephanie Waters. We'll be gearing up for more shows in the near future, so stay tuned! Christopher has been in the paranormal field most of his years. Before founding The SpiritChasers he was greatly involved in the metaphysical community, managing Colorado Springs' largest conscious living store and being a continuous presence working several of the popular metaphysical fairs. With his spiritual and esoteric knowledge, witty mind and abstract humor, he has made a very popular guest on the many radio programs he has been invited on. 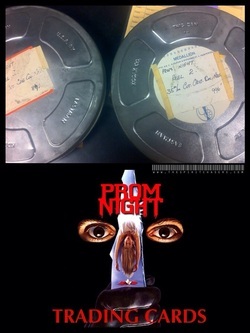 As giddily announced earlier in the summer, Synapse Films is currently at work restoring 1980's brilliant PROM NIGHT, which stars our favorite scream queen Jamie Lee Curtis. The original negative is reportedly in poor condition and is currently at the Synapse lab undergoing splicing fixes and repairs. While we're anxiously awaiting the results in full 1080p ( and getting ready to set up our yearly Jamie Lee Curtis shrine for the Halloween season ), Christopher has taken it upon himself to create an amusing set of virtual PROM NIGHT Trading Cards. Click on our "HUMOR" page to view the whole set. For the uninitiated, you can watch this cult classic in its entirety on YouTube by following the link below. And remember, "If you're not back by midnight...you won't be coming home!"